It is the dream of many flower gardeners to have a large greenhouse to grow tropical plants and start seeds all year. However, many gardeners have neither the space nor the money to install a full-sized greenhouse. A cold frame can act as a mini greenhouse, allowing the gardener to start the growing season well before the last frost. In its simplest form, a cold frame is a box, usually constructed out of wood, with a clear lid made out of glass, plastic, or fiberglass. A cold frame is for gardeners who are ready to move beyond cloches and floating row covers, but aren’t quite ready to invest in a greenhouse. A cold frame can be mobile, or one can dedicate a permanent space in the garden for this structure. Gardeners can buy a range of cold frames, from a basic model made of a steel frame covered with reinforced vinyl, to a deluxe model fitted with double wall polycarbonate panels. Gardeners should consider the growing climate, and how long they wish to extend the season when choosing cold frame models. Accessories can help flower gardeners get the most out of their cold frames. A soil heating cable turns the cold frame into a four-season garden aid. Automatic vent controls prevent tender seedlings from being scorched on unseasonably warm days. Greenhouse bubble insulation helps to trap and retain warm air in cold climates. Constructing a cold frame allows gardeners to customize their frame, and to incorporate recycled materials into the construction. If a gardener has an old window, he can simply construct a wooden box that fits the size of the window. Gardeners who aren’t carpenters can erect a temporary cold frame by stacking bricks or concrete blocks to form a base. Creating a slanted lid and orienting the cold frame so that it faces south makes the most of the wan winter sun. Consider making a cold frame with materials you would otherwise discard to reduce costs. Create sidewalls from plastic soda bottles or milk jugs. Use scrap wood for the frame. Cover the outside of the frame and lid with clear tarps or plastic food wrap. This will last for at least one season, and you won't have much to store during the off-season. Gardeners can start seeds under the cold frame in the ground or in flats. Some seeds are fussy about germination temperatures, so a thermometer is helpful to determine the right time to start seeds. Some cold-tolerant seeds to start under the cold frame include sweet alyssum, forget-me-not flowers, sweet peas, California poppies, bachelor's buttons, and annual larkspur. Gardeners can line the bottom of the cold frame with black cloth or plastic to capture the heat of the day and speed up germination of warm weather annuals like zinnias, cosmos, and marigolds. Keep a close eye on your cold frame and vent it if the temperature gets too warm to avoid baking tender young seedlings. If the cold frame has a generous height allowance, at least 24 inches, the gardener can use it to grow cool weather flowers to transplant size, like pansies, bells of Ireland, snapdragons, or sweet William. 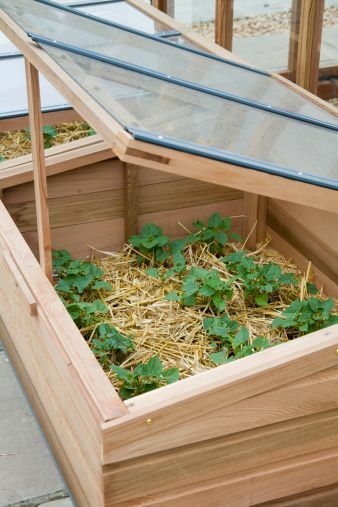 An added bonus is that the cold frame acts as a barrier, keeping out hungry insect pests and rabbits. The cold frame may prove to be too effective, in that it raises temperatures too much for cool weather flowers. A piece of shade cloth cut to the cold frame’s dimensions can provide heat relief if the flowers are setting seed prematurely or getting lanky.